Greg Dotson, of Eureka Midstream, presents $75,000 to the Mid-Ohio Valley Branch of Quality Deer Management Assoc. A large-scale, cooperative wildlife-habitat enhancement project has been initiated in the Lewis Wetzel Wildlife Management Area in southern Wetzel County with a $75,000 donation from Eureka Midstream, according to the West Virginia Division of Natural Resources. This project involves the division, Eureka Midstream, and the Mountaineer and Mid-Ohio branches of the Quality Deer Management Association and will include the application of herbicides in pre-timber and post-timber harvesting units to control undesirable vegetation and promote productive woodland regeneration for wildlife. The project will also include the planting of persimmon trees for wildlife habitat. Additionally, existing wildlife openings will be enhanced by establishing legumes. “We are excited about giving back to the community and, more specifically, directly benefiting the areas where we operate our gathering and compression facilities in West Virginia,” said Chris Akers, president and CEO of Eureka Midstream. “These invasive species affect the regeneration of native plants and provide little benefit to wildlife species,” said District Wildlife Biologist Steven Rauch. Members from both branches of the Quality Deer Management Association will assist with the tree planting and seeding projects. “Our QDMA members are excited about the opportunity this cooperative project provides to get involved with enhancing the habitat on Lewis Wetzel WMA,” said Camron Stover, president of the Mid-Ohio Branch. 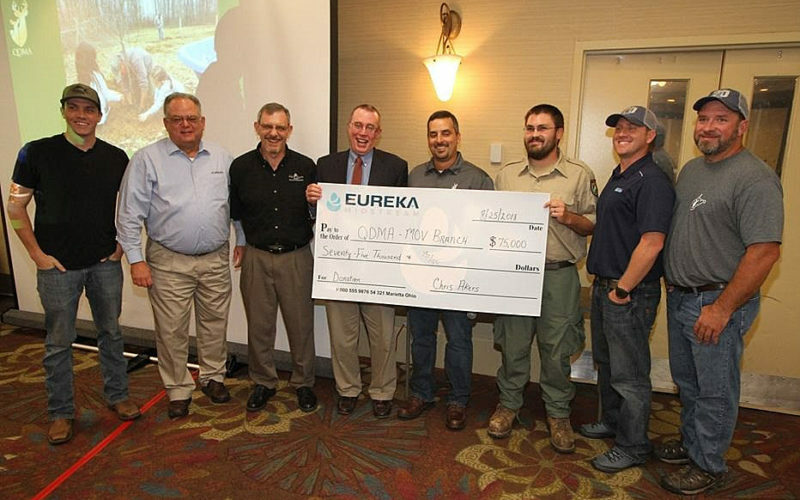 Greg Dotson, director of environmental health and safety for Eureka Midstream, presented the $75,000 to the Mid-Ohio Valley Branch of QDMA at the 2018 Mountaineer QDMA banquet in Morgantown, West Virginia. Next articleFrosty the Snowman — West Virginia’s most famous winter character?